Moving to another home would be challenging, due to the items which you’ll need to pack. These range from the regular items to even the seemingly odd ones. Your stuff will naturally come in different sizes, and it’s quite important to know the best ways to pack them. After properly wrapping and securing your items, be sure to also have an exceptional mover on-call. This way, your movers may be thoroughly advised on the types of items which you’ll be transferring for efficiency purposes. The items on your garage will naturally be complex to pack and you will also need to take some time in sorting through them. You’ll additionally have to choose the right packing materials so your items will get safely routed towards your target destination. In reality, to pack up your garage for a move is not overly complicated if you care to follow some basic rules for packing a garage. To help you finish that seemingly frightening packing job easier, faster, and safer, we have gathered for you the top 25 tips for packing a garage for a move. 1. As part of your storage areas, your garage will require a long time to be sorted out and packed up safely. This is why you need to initiate the packing process as soon as your residential move has been confirmed to guarantee yourself as much time as possible for the tough job ahead. 2. Get your moving calendar and make sure the entry pack garage has a top priority status in it. Remember that if you leave that task for much later in your preparations, you run the risk of being too low on time, energy, and motivation to do what’s required of you. And it’s never any fun to be behind schedule. 3. It’s time to get down to work. The first step is to supply the proper packing supplies as no packing job can begin without them. You will need cardboard boxes, rolls of bubble wrap, moving blankets, packing paper and/or newsprint, packing tape, plastic re-sealable bags, numerous zip ties, and a set of color markers. 4. The best way to pack a garage is to have the packing materials mentioned above. If you can afford to purchase them brand new from a local moving company or a specialized store, then you should do it. If you can’t, there are a number of good ways to get your hands on free moving boxes, for example. 5. Get hold of cardboard boxes that are in good overall condition, and most importantly – strong. Most garage items are heavy so you need sturdy boxes to hold them safely. Also, it’s important to have moving containers in different sizes because of the various shapes and sizes of the things you’re about to pack inside them. 6. You will need bubble wrap for the more fragile and valuable items found in your storage area. The air-filled plastic material is considered by many to provide unrivalled protection for delicate and breakable things. So, if you’re worried about the survival of some of your garage items, wrap them up well in bubble wrap to avoid accidental damage or breakage.Even if you keep your garage neat and tidy, and perfectly organized, start packing up your garage for moving as early as you can to avoid stressful situations. 7. What will prove very useful during the garage packing process are moving blankets. Their protection is excellent, and the great thing about them is that their protective area is big enough to keep larger items perfectly safe during transportation. Specialized moving blankets are ideal, but you can always use the much cheaper variant of using any old blankets you can find in your home as a substitute. 8. You will need plenty of small plastic re-sealable bags to keep tiny parts from being lost while they are being transported together with the predominantly larger garage tools and garage items in general. The small elements /bolts, nuts, screws, etc./ should accompany the main object they are taken from, either taped directly on it or placed beside it in the same moving box. 9. A set of color markers will do you a world of good when you’re labeling your already packed cardboard boxes. In addition to using different colors for easier post move identification, the markers will prevent mistakes regarding what’s what in each container, which in turn will cause you to lose additional time. 10. Sort out all the items in your garage. This sorting task will take time but you just have to do it because of the fact that storage areas usually contain either extremely useful things or extremely worthless ones. Designate two large zones and place all the items you’re taking with you in one zone, and then leave the rest into the second one. 11. Be mindful that some garage items are forbidden for transportation for safety reasons, and your movers won’t move them for you. Items such as fuel, oils, paint and paint thinners, propane tanks, chemicals, car batteries, cleaning supplies and others are considered dangerous. Contact your movers and ask them about the list of forbidden items for transportation. 12. Having found out which items you are not supposed to pack due to their hazardous nature /flammable, corrosive, or explosive/, you have a few good options to get rid of them prior to the move. You best option is to give them away to friends or neighbors, but if that is not worth it for whatever reason, then you can just throw them away for recycling. 13. Before you learn how to pack your garage, it’s time to decide what you will do with all the non-hazardous things you don’t need anymore, and therefore won’t move to your new home. This time, your best bet is to organize a moving sale and attempt to pocket some cash from the possessions that still have a decent market value. 14. And now that you have sorted out your garage items and gotten rid of the ones you either don’t need or are not allowed to transport, let’s describe the best way to pack a garage for moving. The very first garage packing tip? Place all smaller hand tools you have /screwdrivers, pliers, wrenches, etc./ in your toolbox and keep them there during the house move. 15. How to pack garage tools? If no special-purpose toolbox is available, you should use sturdy cardboard boxes of small to medium size to accommodate your garage hand tools. Such tools are known to be fairly heavy, so don’t pack them in large boxes because they will quickly add to the overall weight and may cause the container to break and thus, compromise the moving day safety. 16. Take extra precautions when packing sharp-edge garage and garden tools such as saws and knives of different kind, gardening sheers, pickaxes, rakes, hoes, scythes, etc. Use old blankets, old towels or sheets of bubble wrap to cover the sharp edges or blades, then secure the wrapped up parts with pieces of string, rope, or even zip ties. 17. Also, any garden tools you own with long handles should be grouped together and tied as a tight bundle, as well as protected with blankets or towels as described above. Before you do that, however, make sure they are clean /you don’t want to transfer dirt into the moving vehicle, for example/ and their cutting areas are made safe for transportation. 18. If you own any electric power tools, then you only need to find their original packages for best protection. If not, then detach any removable parts (batteries included), coil the power cord around the tool, wrap the entire body in bubble wrap or a piece of clothing of the right size, and place the bundle into a moving box of suitable size. 19. Moving companies won’t transport any gas-operated equipment you own /lawnmowers, chainsaws, etc./ until you have completely out drained their fuel. If there’s plenty of fuel left in the tank, siphon it out with the help of a hand pump. Keep in mind that it’s dangerous to leave even a small amount of fuel in the tank of gas operated machinery during transport. 20. If used practically as a storage area, your garage may have all kinds of odds and ends. In which case, the very question of how to pack up your garage for a move basically comes down to knowing how to pack the various items found inside it. The task of packing up your garage will be a success as long as you stay away from the top 9 common packing mistakes when moving house. 21. If you own a bicycle or bicycles, then you should know that there are special bike boxes you can purchase from your nearest bike shop. However, you should know that there’s a special way to pack up your bike, and that packing method is not straightforward in any means. The good news is that most of the times you won’t need to do that as your bike can be simply loaded into the moving vehicle as it is. 22. Not surprisingly, the thing you will mostly find inside a garage is a car, and sometimes even a motorcycle. Now, if you choose not to drive your own motor vehicle to your next destination, then you will need to contact a top rated auto transportation company to arrange the details. But before you do, here is some good advice on how to prepare your car for shipping. 23. Use the power of photographs to your advantage! Before you disassemble a garage item to its detachable elements, you might want to take photos of how it’s assembled, especially if it consists of numerous complicated parts. These photographs can help you tremendously later after the move is over when you’re about to put back the item in question. 24. When packing a garage to move, it’s essential that you label properly the packed boxes so that no mistakes or identification errors occur when the time comes to unpack them. Take your black marker pen and write GARAGE on all of the boxes, including their detailed contents. Moreover, it’s a good idea to write down any special handling instructions, such as FRAGILE or THIS SIDE UP, if necessary. Follow the link to learn more about how to label moving boxes like a pro. 25. 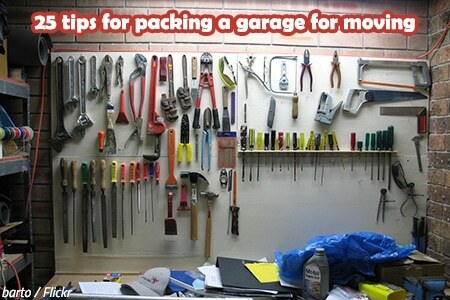 The above tips for packing a garage will help you do a fine packing job all by yourself. Still, if you feel like that particular task is too tough for you, or if you don’t have much time to do it on your own, then it’s best if you get in touch with professional packers and movers. To know more about other moving tips in packing and moving your garage, check out the video below. Aside from your regular items, you will also need to consider packing the seemingly odd but equally important ones. You may have an efficiently functioning aquarium and it just makes sense to bring it along with your fishes to your new home. A 200-gallon aquarium might make your house look cooler than any restaurant entrywayever, but it won’t do much wowing at your new place if it’s smashed into 50 bazillion pieces in the moving truck. To pack it up right, you need the right equipment, says Laura McHolm, co-founder of Los Angeles-based NorthStar Moving Co. There are mirror boxes specially designed for glass—you can pick them up at hardware stores or directly from moving companies. Want to keep your great grandmother’s size-of-a-Buick antique chandelier? Packing the beast up won’t be easy, but it can be done. “Taking several cartons, cutting them in half and taping the pieces together to form a custom-shaped container is a useful strategy,” says Kevin Kato, professional moving expert and content development editor at HireAHelper.com. Just make sure you wrap individual glass pieces very carefully in foam packing paper or thin bubble wrap before placing the whole contraption in your custom box. “If he can’t use the Force to protect himself, [Han] can be slipped into a mattress carton or simply stuck between your mattress and box spring when you load them vertically onto the truck,” Kato says. Giant indoor trees that brush the ceiling are amazing—until moving day. With those fragile limbs and easily wilted leaves, you’re going to have to take special care. “Maintain a set of conditions that imitates as closely as possible the environment in the house,” Kato says. Otherwise, you’ll cause the tree to go into shock. And if it’s extremely delicate, go a step further—some people will even wrap the leaf-bearing branches in dampened newsprint. We’re not going to ask why you have a life-size skeleton in your house. But we do advise caution when moving your medical mini-me—otherwise, when you get to your new place, you might discover the thigh bone is not connected to the hip bone. “Some large items, if they are not completely geometrically insane, can be padded and sheathed in cardboard,” Kato says. Just make sure to carefully wrap the more delicate bones or they might break under the pressure, and make sure the cardboard covers from head to toe (pun totally intended!). We don’t want anything to happen to your reconditioned Flash Gordon, either, so you’re going to need padding—a lot of padding. “Your best bet is to wrap them in blankets or pads—either cloth or the thick brown paper pads the movers use,” Kato says. Gently tape the ends down so everything stays in place. Then, load it strategically into the truck—by stuffing smaller boxes between the legs and around the sides, you’ll keep the heavier pinball machine from moving around too much in the truck. Have your own at-home salon? Lucky you! Well, except for that moving part. Thankfully, these items are more bulky than fragile, but you’re still going need some special care. Your first task will be to find a box large enough to accommodate the item. Pro tip: You can tape multiple boxes together if you’re careful. Once you have the box, use padding to keep the item in place. Or, if you’re feeling bold, just throw them on the truck, boxless. But don’t be surprised if your home salon needs a makeover of its own when you’re finished. Whether you have a baby grand piano or a full-size pipe organ in your living room, moving large musical instruments is never something you should leave up to weak packing boxes. The best advice is to hire a pro. There are movers who specialize in organs, pianos, and other instruments. Be sure to ask your moving company how long the instrument will be in transit so it doesn’t warp. When it comes to a major award such as a life-size leg lamp, the Old Man might have had the right idea. Whether it’s a giant woman’s leg or another piece of cherished art, it is fra-gee-lay and you’re going to need something special. “You want a company that knows how to build a crate out of cardboard or wood, depending on what the item is,” McHolm says. Most moving companies—and companies that specialize in moving high-end or unique items individually—can craft a crate for you. You can always find a way when it comes to packing different types of items. From regular household items to seemingly odd ones, it’s important to set aside some time so you may figure out how they may be securely stored in preparation for your transfer. To ensure the safety of your materials, be sure to book the services of an experienced moving company. WolleyMovers.com is a Chicago based company which can handle residential, commercial and industrial clients. With over 25 years of experience and having served thousands of clients, the company can always assure of efficient transfers every time.